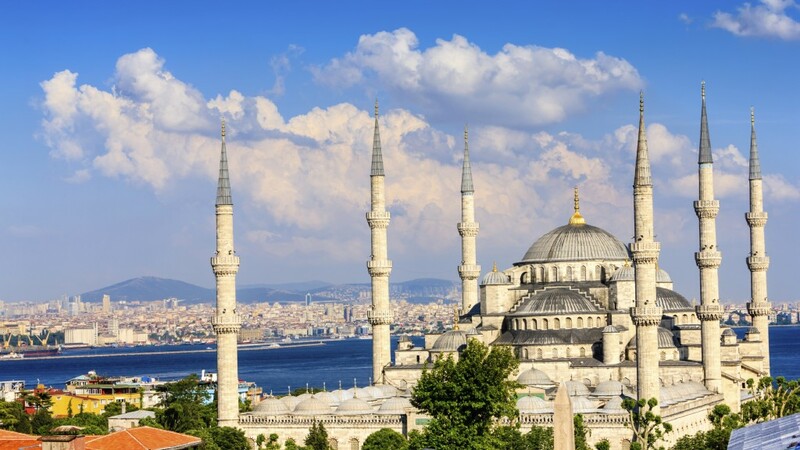 9 Day Tour gives you a great overview of what Turkey has to offer and concludes with the Anzac Day Commemorations in Gallipoli before heading to Istanbul. • We have been running Anzac tours for many years and know what Anzac day in Gallipoli is all about. Welcome to Turkey and the beginning of your Anzac tour! Once you have checked into your hotel (Please note that check in times vary between hotels but are normally no earlier than noon) you have the rest of the day free to explore Istanbul and you will meet your guide later that evening who will give you information about the tour and answer any questions you might have. If you arrive into Ataturk International Airport on the 18th April then your tour includes an airport transfer to your hotel and you will be met at the airport by the Samyeli Travel team. Paid airport transfers from Sabiha Gokcen Airport in Istanbul on the 18th April are also available at certain times (Please see FAQs) and if arriving by alternative means then you will be provided details of your hotel in April by email so you can make your own way there. This morning we partake in a fully guided tour of the only city to span two continents. We will visit the Hagia (St.) Sophia, one of the greatest marvels of architecture, constructed as a basilica in the 6th century by Emperor Justinian. Blue Mosque, facing Hagia Sophia, famous with its blue Iznik tiles and with 6 unique minarets, built in the name of Sultan Ahmet. Hippodrome, center of sportive (chariot races, athletics) events and political activities of the old city. Obelisk of Theodosius, Serpentine Column, German Fountain of Wilhelm IIare the monuments decorating Hippodrome. Topkapi Palace The great palace of the Ottoman sultans from the 15th to the 19th centuries housing an exquisite collection of crystal, silver, Chinese porcelain, robes worn by the sultans and their families, the famous jewels of the Imperial Treasury, miniatures, the Holy Mantle; enshrining relics of the Prophet Mohammed. There will also be free time available for shopping at Istanbul’s famous Grand Covered Bazaar, Most attractive shopping center and biggest “souk” in the world with nearly 4000 shops selling antiques, jewellery, gold, souvenirs and much more… The rest of the day is yours to relax or explore around Istanbul further on your own. Today we will make our way to Pamukkale and part of this journey will be carried out by ferry across the Sea of Marmara which is a great relaxing way to travel. 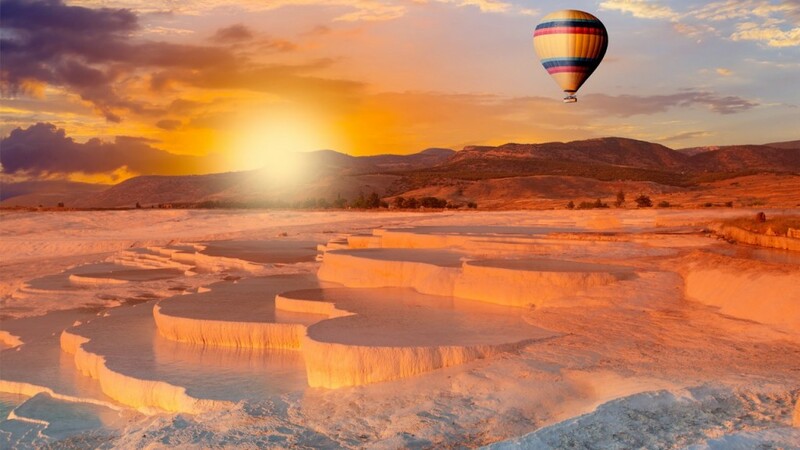 Once we arrive in Pamukkale we will check in to our hotel and the rest of the night is yours to enjoy and relax. Today we wake up early and after breakfast we will look around the Calcium Terraces of Pamukkale and visit the ruins of Hierapolis. 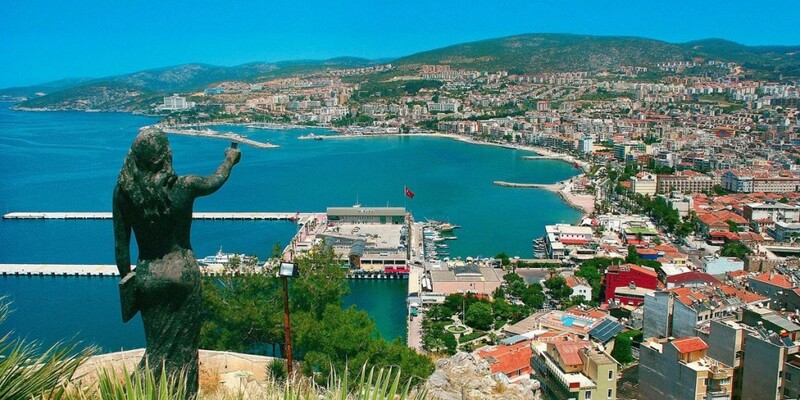 We will then drive to the seaside town of Kusadasi and check into your hotel. Later that day you have the option of a relaxing traditional Turkish Bath. Today we will visit one of the best-preserved ruins in the world….Ephesus. First we will visit the Temple of Artemis, one of the seven wonders of the ancient world where your guide will explain to you the significance of this important site. Following this we will make our way to Ephesus which was one of the most important cultural centers of the ancient word. 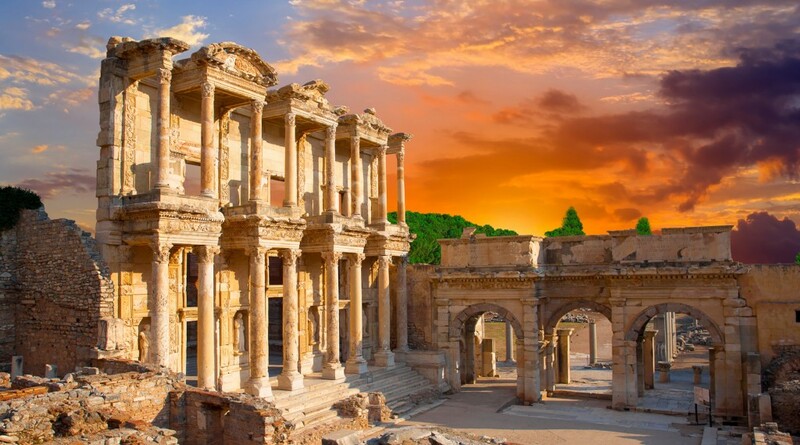 We will visit the Ephesus ruins, Odeon, Celcus Library and the Theatre which is still in use today for concerts and has an amazing capacity of 25,000. As we walk through this ancient site you will notice the streets paved with marble which gives a hint to this city’s great wealth many years ago. Then we will drive to the scenic mountain side Village of Sirince and we will visit the Antique Church, Mosque and Typical Turkish Houses. Sirince is very popular for its style of building, streets and hand made fruit wines and is a nice relaxing way to finish your day. After the tour, we will stop near Selcuk for shopping facilities and a demonstration of the textile production which is famous in this region. After breakfast we depart for Bergama where your guide will show you around the Ancient Medical Center Asclepion in Pergamum. There will be time for a lunch break before we continue on the way to Edremit where we will check in to our hotel in this well known holiday spot for a bit of ‘R & R’. After breakfast we will travel to the ancient city of Troy, the famous archaeological and mythological site which is home of the “Trojan Horse” and “Helen of Troy”. We will then make our way via Canakkale and cross the Dardenelles by ferry to the Gallipoli Peninsula. You will then head to Anzac Cove to get a good spot for the Dawn Service which starts early the following morning. Don’t forget your sleeping bags, warm clothes, wet weather gear and torches because Gallipoli is still as dark and cold tonight as it was 104 years ago when your ancestors landed. 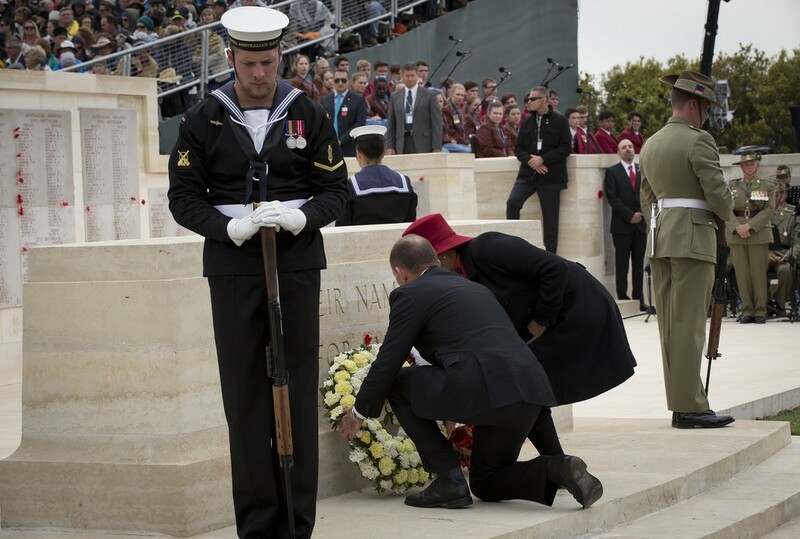 Anzac Day commemorations on the Gallipoli Peninsula are conducted by Turkey, Australia and New Zealand. 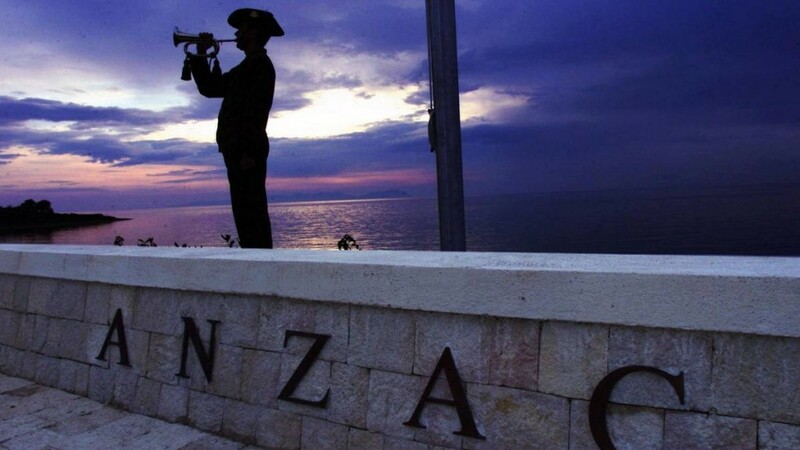 At first light the day begins with the Dawn Service held at the ANZAC Commemorative Site, which will be followed by the Australian and New Zealand memorial services held at Lone Pine and Chunuk Bair respectively. Today is the reason you came to Turkey, to commemorate the sacrifice your forefathers have made. Emotions run high and this afternoon you will travel back to Istanbul, arriving there in the late evening. After breakfast the tour finishes and we bid farewell to our new found friends and exchange e-mails. Wherever you are heading to next you will take unforgettable memories and a new understanding of this country that plays such an important part in your history. Arrival airport transfers are free for customers arriving at Ataturk International Airport between 8am and midnight on the 18th April. For full details on how our airport transfers work and getting to your hotel on the first day of the tour then please see the FAQ section. Accommodation: 3 X Night Istanbul (3 Star), 1 X Night Pamukkale (3 Star), 2 X Night Kusadasi (3 Star) 1 X Night Edremit (4 Star) 1 X Night Anzac Cove. 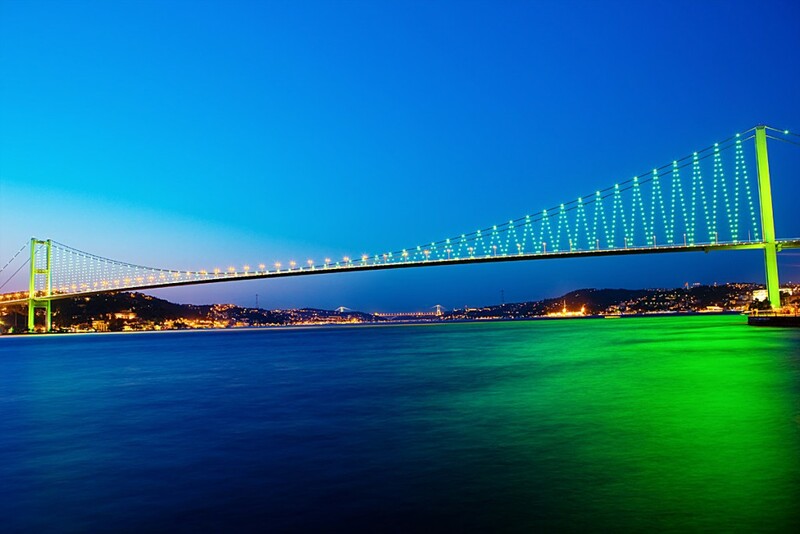 If you wish to arrive in Istanbul earlier than the 18th or stay longer than the 26th then we can arrange pre & post tour accommodation for you although we have limited availability of this. The cost of this is per person £35 for a Double/Twin/Triple or £50 for a single room. Please indicate that you require this when making your booking.